On March 13 I blogged that US filers filing PCT applications in RO/IB needed to pay extra close attention to what time it is in Switzerland. The reason is that in the US, Daylight Saving Time happened on March 13. But did not happen on that day in Switzerland. This meant that for the past two weeks, a US-based filer in (for example) the Mountain Time zone would be able to e-file in RO/IB as late as 5PM and still get a same-day filing date. This differed from the usual drop-dead time of 4PM. Today (March 27, 2016) is the day that Daylight Saving Time happens in Switzerland. The consequence of this is that the time difference between the US filer’s time zone and the time in RO/IB is back to normal. So for a US-based filer in the Mountain Time zone, the drop-dead time returns today to the usual 4PM. This change also affects a US-based filer filing a design application in the IB’s Hague Agreement e-filing system. Until now a US filer of a PCT application had the ability to choose from any of a list of seven International Searching Authorities — ISA/US (the USPTO’s contractors), ISA/EP (the European Patent Office), ISA/KR (the Korean patent office), ISA/AU (the Australian patent office), ISA/RU (the Russian patent office), ISA/IL (the Israeli patent office), and ISA/JP (the Japanese Patent Office). Starting a week from now, on April 1, 2016, US filers will be able to choose from a longer list of eight International Searching Authorities. USPTO did a good thing recently. About a year and a half ago, I pointed out (see blog post) that the USPTO was publishing the IP addresses of trademark customers. This was a Very Bad Thing. I am delighted to be able to report that USPTO has taken corrective action. Patent applicants and practitioners need to be extremely vigilant for the possibility that the USPTO might mail out a new patent Filing Receipt after a Notice of Allowance. Failure to pay close attention to such a new Filing Receipt, and failure to take prompt action when called for, could lead to a granted patent with different information on the front page than was intended. Will you be in Orlando at the time of the 2016 INTA annual meeting? If so, you might want to attend the twelfth annual Meet the Bloggers. This is your opportunity meet the writers of some of the most widely read intellectual property and trademark related blogs. To find out more, go to http://www.meet-the-bloggers.com/. As of today, there are fourteen seats left for USPTO’s Design Day 2016. For more information about Design Day and to learn how to register, click here. I was reminded today of one of the benefits of a radio controlled wristwatch. 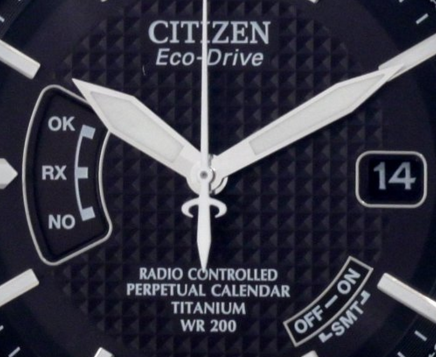 A radio controlled wristwatch contains a sensitive AM radio receiver that picks up radio transmissions from a government time standard such as WWVB. WWVB transmits digitally coded time signals on 60 kHz. A watch or clock equipped to receive the WWVB signal can synchronize itself to the government time standard and thus can be consistently quite accurate. Such a wristwatch is designed to check the WWVB signal in the middle of the night, because night-time conditions in the ionosphere permit such signals to propagate much further than during the day. There are similar government time standard radio stations in China, Japan, Great Britain, and Germany. The watch in the photograph picks up the Chinese and German signals as well as the US signal. Which brings us to the fun thing about radio controlled watches. A radio controlled watch automatically corrects for daylight saving time changes. At 2:00 AM this morning, this watch automatically “sprang forward”. There was no need to manually adjust this wristwatch for daylight saving time. Most PCT filers know that there are always a minimum of two Receiving Offices (and sometimes more than two) available to any PCT applicant that is entitled to use the Patent Cooperation Treaty. For example for a US-based PCT applicant, the ROs available are (at a minimum) at least RO/US and RO/IB. And most PCT filers also know that there can sometimes be very good reasons to use RO/IB rather than RO/US. Indeed there are some fact situations where it is tantamount to malpractice to fail to use RO/IB rather than RO/US. Given all of this, it is very important to keep in mind that for the next two weeks, the drop-dead time of day for filing in the RO/IB will be different than it is for most of the year. Normally the drop-dead time of day for filing in the RO/IB is 4:00 PM (for filers in the Mountain Time Zone). That is, the time in Switzerland is eight hours different from the time in Denver. But for the next two weeks, the drop-dead time of day for filing in the RO/IB will be 5:00 PM (for filers in the Mountain Time Zone). Said differently, for the next two weeks you could file in the RO/IB an hour later than usual and still receive a same-day filing date.